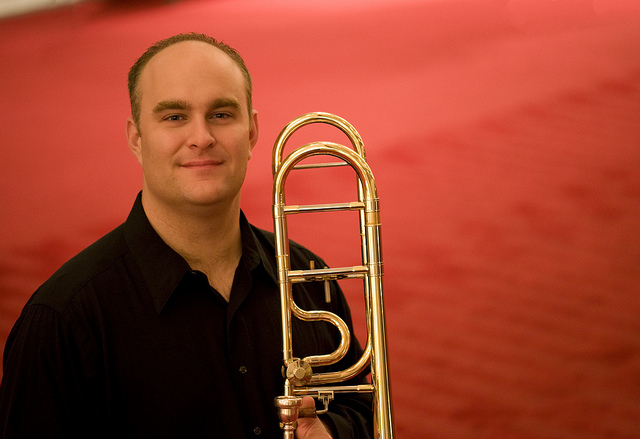 Lee Rogers, a native of Dallas, TX, currently holds the position of Principal Trombone with the Kennedy Center Opera House Orchestra, a position he has held since 2007. He also serves as Principal Trombone of the Harrisburg Symphony Orchestra. Rogers received a bachelor's degree from Southern Methodist University where he studied with John Kitzman. Shortly thereafter, he recorded Eric Ewazen's Concerto for Trombone with SMU's Meadows Wind Ensemble on Gasparo Records. In 2002, Lee earned a master's degree from The Juilliard School where he studied with Joseph Alessi. After graduating from Juilliard, Rogers traveled to Japan to represent the United States at the Kyoto International Music Students Festival where he presented a solo recital of American music, including Paul Creston's Fantasy for Trombone. Rogers has performed and recorded with the Dallas, Cincinnati, Grant Park, National, and Baltimore Symphony Orchestras as well as the Buffalo and Naples Philharmonic Orchestras. Highlights include performances in Carnegie Hall and Vienna's Musikverein with the Dallas Symphony Orchestra as well as their 2000 and 2001 summer residencies at the Vail Valley Music Festival. As a member of the Cincinnati Symphony, Rogers participated in numerous tours including Japan, Europe, Carnegie Hall, China, and Singapore. In August, 2010, Lee recorded the first ever CD devoted entirely to low brass orchestral excerpts with members of the Iceland and Melbourne Symphonies. He has twice performed as a guest artist at the Eastern Trombone Workshop in Washington D.C. In 2011, Lee joined the faculty of the Round Top Summer Music Festival in Round Top, Texas where he has been a soloist with the Festival Orchestra. Rogers was honored to participate in the National Symphony Orchestra's South American tour in 2012. In early 2014, Lee performed several weeks with the Orchestre Symphonique de Montréal as guest tenor tubist and trombonist. Works performed throughout Canada and Europe included Mahler's Symphony #7 and Berlioz's Symphonie Fantastique. Rogers has been engaged numerous times as a substitute with the Philadelphia Orchestra.